Low moods, anxiety, and fatigue - these are all common symptoms of menopause, and known to cause junk food cravings. Unfortunately, many symptoms of perimenopause, such as lack of sleep and hot flashes, may be exacerbated by a lack of nutrients or excessive fat and sugar. 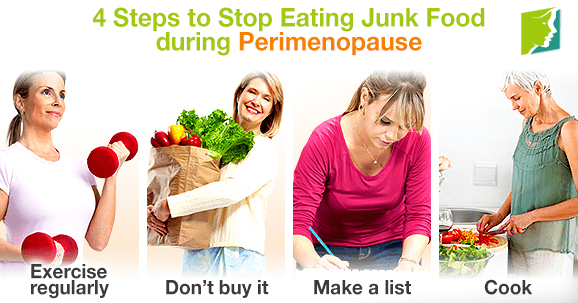 Follow these four steps to stop eating junk food during perimenopause. Unhealthy eating habits go hand-in-hand with sedentary lifestyles - sitting in front of the TV will make you want to snack more than if you're active. It also means you're not burning calories. Doing something active will keep your mind off food and result in less snacking. In addition, exercise can improve your mood by releasing serotonin and endorphins. Exercise between 20 to 30 minutes every day. Having junk food in the house can be a temptation for anyone, especially if you're going through perimenopause and liable to have low moods. Low moods can result in the urge for a little “pick-me-up” - and the fastest way to get this is a high-sugar snack. The effects won't last long, though - this will inevitably lead to a “sugar crash” and possibly intensify perimenopause symptoms. Filling up your fruit bowl rather than your cookie cupboard means that when you do feel the urge to snack, you will pick up a fiber-rich apple instead, which will keep you full for longer. Planning out your meals in advance and shopping based on only what is on your list will prevent “impulse buys”. When shopping, it's a good idea to not go hungry, as this will make junk food seem more attractive. Many people eat junk food because they don't have the time to cook proper meals. This leads to grabbing and eating fast foods, which are highly processed and won't keep you full for long, leading to more snacking. Learning a few quick and simple recipes will keep you fuller, and a home-cooked meal has more nutrients than a fast food dinner. Getting the bulk of the cooking done on a Sunday and reheating as the week progresses will also help you avoid junk food. Junk food is a big contributor to weight gain and should be avoided most of the time. Trying to develop a taste for healthier foods and snacks may take a little while, but eventually will mean you stop craving the junk food. Follow the link below to learn more about the options available to deal with perimenopause.